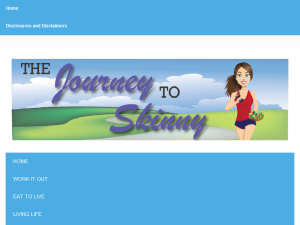 The Journey to Skinny is a place to find workout tips, from running to weight training, healthy recipes, weight loss advice, and many other topics, such as parenting and vacations. From home life, healthy recipes, fitness - this blog has quick/easy read posts that are fun to read as well as informative. Like receiving advice from a friend! Highly recommend - a fun daily read! This what your The Journey to Skinny Blog Ad will look like to visitors! Of course you will want to use keywords and ad targeting to get the most out of your ad campaign! So purchase an ad space today before there all gone! If you are the owner of The Journey to Skinny, or someone who enjoys this blog why not upgrade it to a Featured Listing or Permanent Listing?